The Open Campus of the University of the West Indies (UWI) is launching its second ‘ScholarShip’ Cruise and Learn Adventure series scheduled for April 6 to 17, 2014 aboard the Coral Princess from the elegant Princess Cruises Line. “We’re continuing our tradition of linking the Caribbean through innovative activities in higher education,” said UWI Open Campus Pro Vice-Chancellor and Principal Professor Hazel Simmons-McDonald, who initiated the idea of the cruise. Attentive but relaxed 2011 ScholarShip cruisers listen to Donald Anthony, St. Lucia. The 2014 trip originates from Fort Lauderdale in Florida, with ports of call at Ocho Rios in Jamaica; Limon in Costa Rica; the Panama Canal and Colon in Panama; Cartegena in Colombia; and Aruba. The campus head said the idea was designed to make deeper inroads into the UWI alumni market through making significant connections, generating goodwill for the UWI across the Caribbean region and the diaspora, building strong family and friendship memories and forging a unique and intriguing Caribbean experience among fellow passengers. The UWI Open Campus ventured into the world of travel through this sea adventure in order to offer a broad educational experience of the Caribbean, campus media spokesperson Suzette Wolfe said. 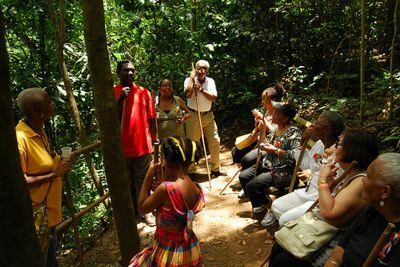 The cruise was designed to bring more focus on Caribbean education and history and the UWI’s contribution to the growth and development of the region, by featuring the best of what the UWI has to offer through its on-board and on-site researchers, historians, linguists, archeologists, naturalists, and other specialized academic areas. Guests will enjoy learning interesting facts and figures about the different countries from exciting presentations by guest lecturers before exploring the countries. The first ScholarShip Cruise and Learn Adventure in 2011 was very successful based on the glowing accounts by those who made the trip. Many friends from the UWI were reunited after several years apart, reconnected with families, learned about their Caribbean neighbours and established strong network connections on the cruise. “We hope that more UWI stakeholders across the region and outside of the region will book to cruise with us next April as their generous support will create an unforgettable life experience for them, and will also help us to create incredible educational opportunities for future students of the UWI,” Professor Simmons-McDonald said in expressing her delight about the upcoming cruise in 2014. 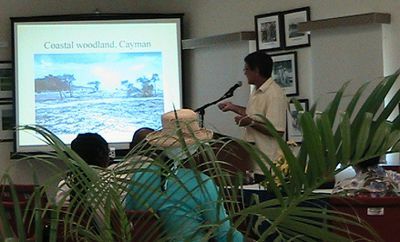 Prof. Sean Carrington speaks to cruisers on Caribbean flora and fauna during the 2011 ScholarShip Cruise. The programme will include a briefing on the historical, cultural, maritime and geo-political features of each port and the bio-diversity linking the Caribbean and Central and South America, with speakers and facilitators from the University of the West Indies. The 11-day cruise will also feature in-country visits to several interesting sites. The University of the West Indies (UWI) has evolved from a small college of London University in Jamaica with 33 students to a full-fledged University with over 40,000 students. It is the largest higher education provider in the English-speaking Caribbean, with main campuses in Barbados, Jamaica and Trinidad and Tobago, and Centres in Anguilla, Antigua & Barbuda, The Bahamas, Belize, Bermuda, British Virgin Islands, Cayman Islands, Dominica, Grenada, Montserrat, St Christopher (St Kitts) & Nevis, St Lucia, and St Vincent & the Grenadines. The UWI launched its Open Campus in 2008. It is a virtual campus with online and blended programmes and courses being offered across 45 physical site locations across the region, serving 16 countries in the English-speaking Caribbean. The UWI is an international university with faculty and students from more than 40 countries and collaborative links with over 60 universities around the world. Through its seven faculties, the UWI offers undergraduate and postgraduate degree options in Engineering, Humanities & Education, Law, Medical Sciences, Science & Technology, Food & Agriculture, and Social Sciences.